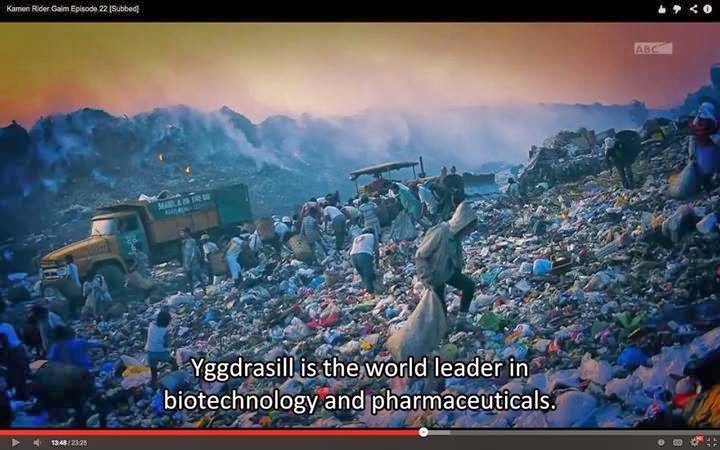 Satirical News: After Gaim Showed Manila's Garbage Dump, Pinoy Pridists React Angrily! In episode 22 of Kamen Rider Gaim, Manila made a cameo showing the dirty garbage dump in Manila (in a cameo), Pinoy pridists react! In fact, Tongressman Loko Atienza who proposed to ban the airing of foreign telenovelas rather than regulate them got mad again. Pinoy pridists are outraged and demanded Kamen Rider be banned from ever being shown after being butthurt. Tongressman Loko Atienza also planned to ban Kamen Rider as well and everything else related to Toei to prevent them from ever entering the Philippines to give priority to crap Pinoy television. "We can't allow nations to disgrace the Philippines like this! This is our paradise!" replied outrage Pinoy pridist Waldas Kalat. He was outraged and decided to support Tongressman Loko Atienza. He was known to be a diehard Pinoy pridist who was in favor of Pinoy dramas, banning all of what he called "garbage" but forcing foreigners to watch their local trash. Worse, he was also in favor of removal of Filipinos' rights from bringing copyrighted materials abroad while forcing foreigners to buy the garbage the Filipino media has to offer. The Pinoy pridists could be seen rallying boycotting Toei for that scene. During their really, Toei merchandise like Power Rangers toys, Kamen Rider toys, Super Sentai toys and the like were thrown into the fire. They called Toei as a racist institution. Meanwhile Toei offers no apology whatsoever for showing this reality to Filipinos. Some Filipinos however said that Toei did the right thing in exposing what the Nobitard media and the leftist media refuses to show to the Philippines. Well if that scene was in a Koreanovela, the more Loko Atienza will like to push his proposal forward!